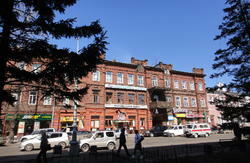 Excellent location in the Irkutsk city center! Friendly atmosphere and many tours to lake Baikal! Start your travel to Great lake from our hostel! 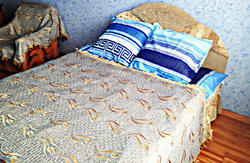 Our hostel is located in the historical center of Irkutsk near Kirov square and hotel Angara. Location of hostel is really very convenient; walking distance (5 minutes) to the most popular city sights: Angara river, square Kirova, the square of free churches, Art museum, the houses of Decembrists. Shops, ATMs, cafes and night clubs- everything is close to you! 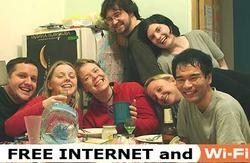 The hostel has all facilities, clean and cosy rooms. We offer to our guests three rooms: 6 beds dormitory (3 bunk beds), twin room and twin room ( extra bed is possible). Shower cabin, bath and toilet are shared. We have light breakfast, on our guest kitchen hot water, tea, sugar, bread, cereals are available free of charge. Refrigerator, electric cooker and microwave are for your disposable. Our kitchen has all utensils. Our friendly staff always can give you information about city sites, transportation, schedules; book train and bus tickets. We organize for our guests tours to Olkhon island (Khuzhir , Sunny hostel), budget accommodation, Siberian cuisine and excursions all around the island, departing every day. We sell tickets from Irkutsk to Olkhon island and back, you can book it by e-mail or by phone to our manager, minibus can pick you up from hostel every day at 10 a.m. You can also book tickets to Circumbaikal train and tours to Listvyanka. 1) The easiest way to get to the hostel from the airport is to take a taxi. The highest possible taxi price is 300 rubles total.